These knives offer incredible portability, making them really convenient for those trips where you need to travel lighter or when you just don’t have enough space for a big knife. They will offer, nonetheless, a great performance and effective cutting so you can cut whatever you want in any shore you need. Easily, one of these knives can be the perfect knife for any of your activities in the wilderness – but not all of them will deliver that quality you are looking for. Want to have the knife that looks exactly like a Michael Corleone’s knife from the movie The Godfather and still get really good performance? There’s no doubt this knife will offer exactly that and much more. It is not the most outdoor-oriented on the list, yet it is good enough to be used without a problem and still deliver an effective performance. 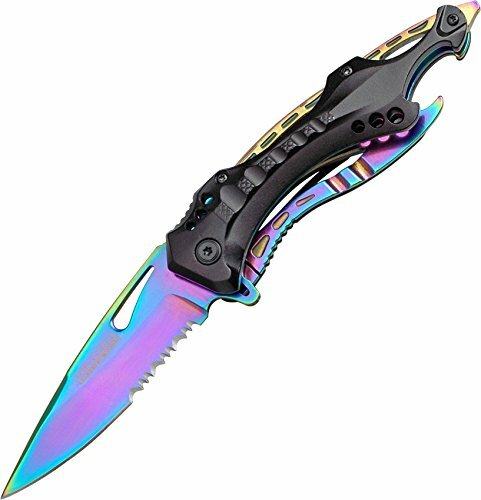 This knife features a 4.5-inches length blade made of stainless steel with a Chromed handle of the same length. The knife is foldable and comes with a Liner Lock Belt Clip for easier using and easier folding when not. For those who need a more classic design and still get a perfect performance, the Elk Ridge Gentleman knife is a good choice without a doubt. This knife features a really good 4.5-inches Pakkawood handle that offers great comfort and grip. 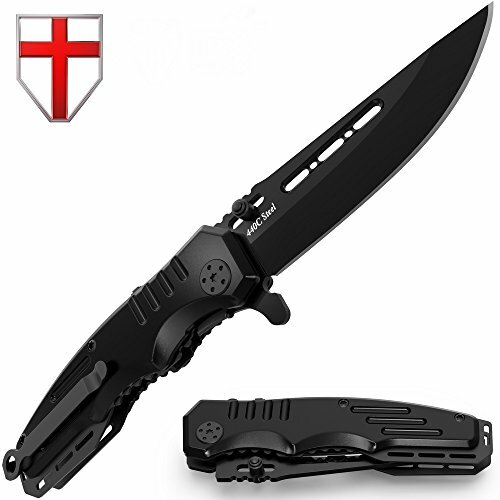 The blade is also really good, with a 3mm thick drop-point blade with 3.25-inches length and a foldable design. The entire blade is totally reliable and really well-made, offering great usability and a completely beautiful design that any man would love. Easily, it can make the perfect camping companion for those who need superior portability as it is only 4.5-inches long when folded and can fit anywhere. 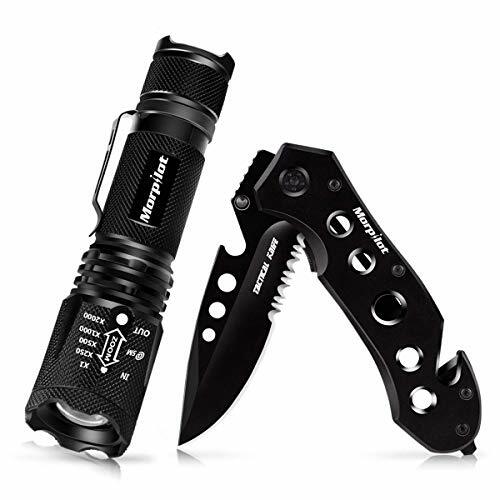 Pakkawood handle, black stainless steel blade, spring assisted liner lock knife with the perfect quality of all TAC Force products, this one will help you even in the most unusual of activities without a problem. It is 4-inches long when folded and goes up to 7-inches when using, offering a 3-inch blade with a 3mm thickness that will cut anything at any time. The handle is really well made to offer additional comfort and grip. It works perfectly for any type of hand and can be used even in hard conditions as it is totally reliable. The folding system is really good as well, making sure you can use it at any time without having to lose your time unfolding it. A beautiful design can also be incredibly effective, that’s exactly what this Winchester Brass Knife is, a really good combination between a good-looking design with an effective performance to make the knife a perfect choice for anyone. It offers a surgical stainless steel blade with a wood handle and brass bolsters for increased comfort and superior grip. The blade is extremely sharp, and despite its really low price, it will last longer than most without a problem. The handle is 3.5-inches and the blade is 2.5-inches long, making it totally portable and easy to carry – as well as totally reliable to use for any type of cutting. A sleek construction with perfect performance, the Grand Way 440C steel blade knife is a really good choice without a doubt. It is balanced to offer much better performance, making sure it is sharp and comfortable to use at the same time. This tactical knife features a folding feature so you can enjoy a superior portability and convenience thanks to the liner lock system. The handle is extremely effective as well, with a reverse or direct grip for increased reliability and an aircraft-grade aluminum construction for more durability. The knife is totally easy to use, as it offers a monostatic deep clip and a totally reliable opening mechanism for easier use. The blade is 3.5-inches long, the handle is 4.4-inches and the entire blade goes up to 8-inches for a comfortable experience. Smith & Wesson always delivers some of the highest-quality products when it comes to knives and the like, and it is more than easy to say that this knife is exactly that and much more – a high-quality, performance-oriented, really effective knife made of carbon stainless steel and black aluminum. The blade is 3.1 inches long and the handle is 4 inches, long enough to offer a great performance and also be easy to store. The knife offers a good clipping folding system and features Ambidextrous Thumb Knobs and an Index Knob for superior grip and perfect comfort when using. Made of titanium coated steel, this HR-15 knife from Hoffman Richter is both an illustration of reliability and performance in a single product, offering the perfect quality every outdoor enthusiast needs. With a 3.75-inches 440C steel blade, it offers an incredibly sharp edge with a really good-looking design entirely. The handle is made of the same steel, with a good construction for better grip. The knife comes with a 300-pound cord and a glass breaker for superior convenience. The liner lock is totally safe and the opening is fast and reliable. The 1990X Brawler is a knife that offers impressive performance, wonderful quality construction, a reliable design, a well-made locking system and an entirely travel-efficient dimension to be used and stored anywhere without any problem. The blade is 3 inches long, the handle is 4.1 inches and the entire knife is about 7.2 inches completely, a good size when unfolded. The SpeedSafe opening is totally reliable, making sure you have a safer use. The flipper makes it easier to manage the blade and the 4-position clip will help the user to store it or attach it more easily in your clothes. The Chrome Vanadium Case Medium pocket knife is a perfect addition to any traveler as it is incredibly effective, wonderfully sharp, utterly convenient and totally easy to use despite its multi-tool design. Easily, the Case Stockman knife will offer the performance anyone desires, and will for sure last longer than most knives on this list. The Clip Blade is easy to use and to unfold when needed. It features two additional blades as well, a Sheepfoot and a Spey, so you can have a more convenient tool to use for different things. Also, the Chrome Vanadium construction makes it incredibly reliable, durable and effective at all times. Want to know which is the king of pocket knives? Victorinox. This brand is a true quality-oriented provider, making some of the most reliable and useful tools for outdoor activities for years, and with this Swiss Army pocket knife, there’s no doubt they keep doing a wonderful job. The knife is made of stainless steel entirely, offering 30 different tools made of the same material for increased reliability and effectiveness. 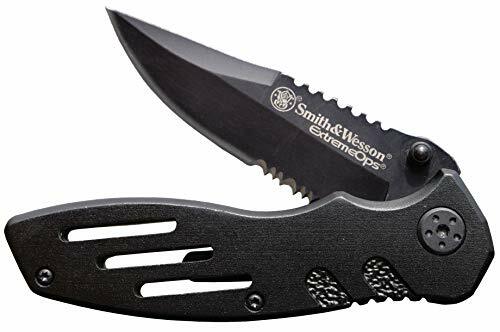 You can do practically anything with this knife, and despite being smaller than others in this list – it will still be good enough to be used for any activity and offer great performance. There are many designs for this type of knives, and depending on that you will make your choice. Most pocket knives are made with a simple foldable design, offering more comfort and portability. However, some of them are made for hunting and fishing, others are made for more camping activities like cutting wood or food, and others may be used for many other things, including home chores. The ones that are better for hunting look more sleek and tough, mostly made of stainless steel for superior grip and durability for this type of activity. The ones that are mostly made for camping activities tend to be simpler, offering a classic or conventional look, sometimes with wood construction. And the multi-tools, the ones that can be used for many different things are also available, these may come with up to 30 tools and are often known as the Swiss knives. A good pocket knife shouldn’t be larger than 4.5-inches when folded and shouldn’t go further than 9-inches when unfolded. It shouldn’t be thicker than 3.5mm either and should offer enough comfort and space-efficacy to be stored anywhere. Pocket knives perfect dimensions are 3.5-inches blade and a 3.5-inches handle – making sure it is also 4 inches or less when folded. The materials of the knife will tell you how durable and effective the knife is. These knives, for example, are mostly made of stainless steel, sometimes coated with aluminum, platinum, vanadium or even better materials for increased performance. Often, the handles are made of rubber and TPE, however, the most common knives are made of the same material as the blade, and others, the most conventional ones, offer wood handles for easier and most comfortable use. Hunting pocket knives, survival pocket knives, and multi-tool or Swiss knives are pretty different from each other. Consider the differences with patience before choosing. A multi-tool knife should offer at least two knives and other tools such as a screwdriver, sharpener, and even a corkscrew. The bigger the knife, the harder it is to travel with, and the smaller, the less efficient it will be for different activities. Go for those which offer a good balance between length and construction. The locking or folding system is really important to consider. This will tell you how reliable and safe the knife is. 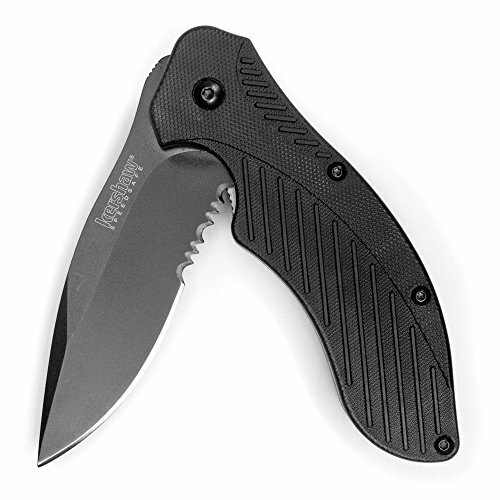 A clipping system is a must in each folding knife you consider. Need to choose the perfect knife for your next outdoor activities? You may need to take a good look at this guide, learn more about pocket knives and eventually try to consider each option and recommendation we gave so you choose the perfect one. It is totally easy to find the perfect pocket knife for your next adventures – so don’t let yourself to get disappointed by making a bad choice, check out everything you need to consider and choose accordingly. The right pocket knife will help you immensely in the wilderness, and even more when you choose the right one. Here’s what you need to know to make the right choice.